Convert your Ruger MarkIV or IV22/45 Pistol into a lightweight, easy packing tack driver with the Pac-Lite "upper" barrel system. These threaded end barrels replace your factory barrel and receiver with lightweight anodized aluminum (the barrel is lined with precision button rifled steel). This Pac-lite barrel includes adjustable iron sights and a threaded muzzle with thread protector. Drilled and Tapped for a Pac-Lite scope base. Please Note: Pac-Lite barrels are actually serial numbered uppers that require FFL transfer paperwork. When you order, download your dealer FFL or ask that dealer to FAX (320-834-3002) or email ([email protected]) a copy of their FFL to us (EABCO) along with your name and order number. 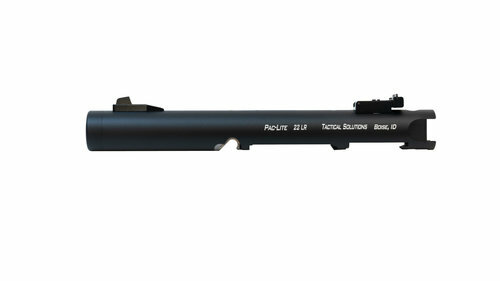 We'll ship your Pac-Lite barrel to your dealer where you can go and pick it up. We are not able to ship this item to California or Washington D.C.
- Ruger, Mark IV and IV 22/45 are trademarks of Sturm, Ruger, & Co. Inc.